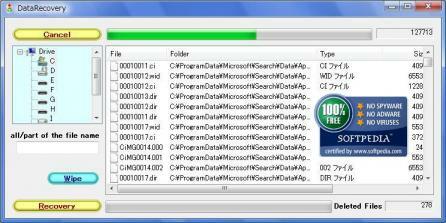 DataRecovery is a software program that will allow you to undelete files that you accidentally deleted. The program written by Tokiwa does not guarantee that it can undelete all files, as it is dependent on the configuration of your system but can in most cases recover deleted files even after being sent to the recycle bin. In order to use the program with Window NT, Windows 2000, Windows XP, and Windows Vista you will need to have an administrator account. In order to wipe out your deleted files the program will need to write NULL directly to disc. The 1st character of a file name is often overwritten by delete code when a file is deleted on FAT volume. In this case, that character will be replaced with the symbol $ on the displayed list. With Windows Vista the operating system has a file protection so that filed cannot be wiped out. Norton UnErase will stop the program from searching for deleted files. If you receive a Runtime Error while scanning your drive, you will need to contact Tokiwa in order to receive a debug version. Powerful and fast file sync utility.